The built-in-America 2014 Volkswagen Passat is pushing her way into the heart of U.S. auto sales with striking good looks and top-of-the-line quality. We drove one for a week and now understand why there is so much momentum behind the 2014 Volkswagen Passat Sport. Volkswagen knows how to design and build cars, so it comes as no surprise that the 2014 Passat is one of the best looking cars on the road regardless of price. The Passat’s balanced proportions give it elegant and timeless styling, reflecting the new Volkswagen Design DNA. The clean design, with a predominance of horizontal body elements, reinforces the Passat’s position as the sophisticated choice in the mid-size segment. The key identifying feature of a strong brand is the styling of its front end. Here, the Passat displays the horizontal brand face, with the three-blade grille and headlights forming a single unit. The Passat’s grille is sculpted in a three-dimensional shape and makes a distinctive and elegant impression because of its strict geometry. Beneath the front bumper is a large, lower intake with a striking honeycomb surface and available fog lights housed at each end. From the side profile, the muscular ridge in the sill area creates a lively interplay of light reflections. Powerfully sculpted wheel arches emphasize the dynamic properties of the Passat. To emphasize the aerodynamic styling of the Passat, the roof lines flow toward the back with a nearly coupe-like cut of the rear window. Three side windows create luxury-class style with a long, extended glass surface. The rear section is also dominated by horizontal lines. The lines of the large taillights rise toward the sides, underscoring the dynamics of the elegant rear styling. Another unique feature here is the design of the two-part taillights that are integrated in the rear fender and trunk lid. This is a generously proportioned four-door sedan and the largest Passat ever. Nose to tail it measures 191.6 inches and features a stretched 110.4-inch wheelbase and 72.2-inch width, which allows such exceptional rear seat space. The first thing that stands out when entering the cabin of the 2014 VW Passat Sport is the extraordinary amount of space available. There’s room for five adults to really stretch out in comfort, and with four large, wide-opening doors, getting in and out is a breeze. There’s also a true elegance and simplicity about the layout. Nothing here is trendy or over-done. The lines flow in a style that’s easy on the eye, complimented by high-quality materials applied with attention to detail. Available chrome-trimmed gauges surround a digital multifunction display. A high-end chrome look is also applied to the air vents in the cockpit, and to the surrounds of the radio, navigation system and the climate control panels. The rotary light switch and parking brake handle button are also treated in chrome. The seats are exceptionally comfortable, with an emphasis on providing extra thigh support for long-distance road trips. The driver’s seat adjusts eight ways, including lumbar, while most models feature eight-way power adjustment. Our test model featured Volkswagen’s characteristic perforated V-Tex leatherette seating surfaces, which we are not big fans of as is. We think it’s worth it to pay extra and move up to the SEL model for real leather seating surfaces. There is no shortage of entertainment system options with the Passat, but one of the best is the Fender Premium Audio System, which was designed to bring the raw emotion of a live music performance to the driving experience. The system was developed through collaboration between Fender, the legendary music amplification experts, who also make some of the coolest guitars for the rock star elite, and Panasonic. It cranks out 400 watts of power played through nine speakers, including a trunk-mounted subwoofer. And the same cool chromed Fender logo that has graced the guitar amps of some of the world’s music legends is featured on the Passat’s Fender system. For 2014, all trims with the exception of the base S model received VW Car-Net connected services and rearview cameras, which were previously found in SE and above trims. 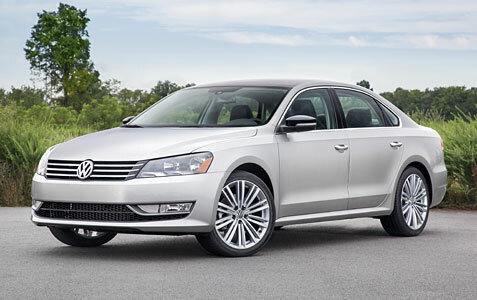 “Smooth” is the one word that describes the driving experience in the 2014 Passat. The 1.8 liter turbo four-cylinder engine produces 140 hp and 236 lb-ft of torque. The results are crisp, quick shifts without the loss of power that is experienced with a traditional manual gearbox. It’s the perfect choice for drivers who want the performance of a traditional manual transmission with the precision of an automatic. It all comes together when taking the Passat on winding roads and you can feel the grip of the pavement. The Passat was clearly designed to feature the kind of dynamic, involved handling and precise steering that drivers have come to expect of a Volkswagen. 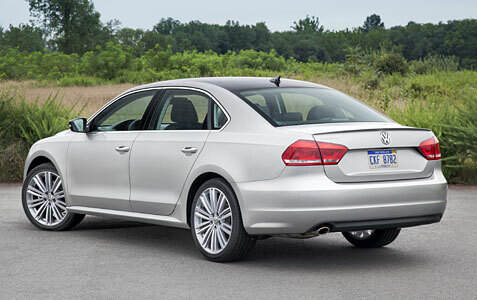 The 2014 Passat may be a big car, but it drives small! Its front suspension features the proven Volkswagen formula of damper struts with robust lower control arms, coil springs and an anti-roll bar. At the rear, there’s a sophisticated four-link independent layout with telescopic dampers and an anti-roll bar. The new electro-mechanical power steering is perfectly weighted to provide a balance between precision at highway speeds and lower steering weight at parking speeds. Swinging into that tight, mall parking spot is easy thanks to the Passat’s 36.4-foot turning radius and three turns lock-to-lock. Naturally, every 2014 Passat comes with Electronic Stability Control (ESC) that helps compensate for over steer or under steer by applying individual corrective forces to each of the wheels. Also standard is an Anti-lock Braking System, Hydraulic Brake Assist, Tire Pressure Monitoring and Volkswagen’s acclaimed Intelligent Crash Response System. In the event of a collision, it automatically unlocks the doors, shuts off the fuel pump and even turns on the hazard warning lights. The 2014 Volkswagen Passat is an American-built mid-size sedan with the space and comfort of many full-size models, offering remarkable, best-in-class, stretch-out rear-seat legroom and trunk space to match. Volkswagen’s Chattanooga plant that produces the Passat is part of a $5 billion investment by the company in the U.S. market. The facility was designed to keep environmental impact to a minimum and includes a revolutionary paint shop that significantly reduces emissions. We were very impressed with all facets of this car and with the combination of a sleek design and spacious modern luxury in the cabin. Starting prices for the entry level Passat is around 20K, so rivals must be trying to figure out their next move!